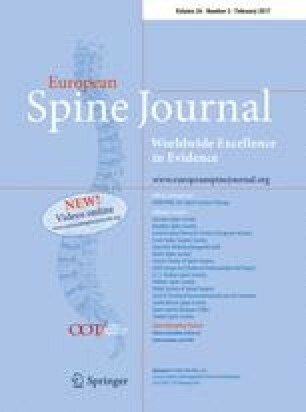 The aim of this study was to assess the clinical course of pain and disability in patients with lumbar spinal stenosis following surgery. Electronic databases were searched to July 2014 and only prospective cohort studies assessing pain or disability following surgery for lumbar spinal stenosis were included. Two independent reviewers extracted data and assessed study quality. Estimates of pain and disability (expressed as 0–100 point scales) as well as 95 % confidence intervals were obtained using meta-regression. The effect of time was clearly non-linear, so it was modelled using fractional polynomial regression. From a total of 10,741 titles, 69 publications (64 cohort studies) were included in the review. Pooled estimate for pain pre-operatively was 63.4 (95 % CI 56.5; 70.3), reducing to 33.1 (95 % CI 24.2; 41.9) at 3 months and 19.2 points (95 % CI 9.2; 29.3) at 60 months. Pre-operative estimates of disability were 36.9 (95 % CI 32.6; 41.3), reducing to 16.3 (95 % CI 11.8; 20.9) at 3 months and 12.4 (95 % CI 7.7; 17.2) at 60 months. Patients with lumbar spinal stenosis experience rapid symptom reduction after surgery, but should still expect to experience mild-to-moderate pain and disability 60 months later. Systematic review registration: PROSPERO 2013: CRD42013005988. The online version of this article (doi: 10.1007/s00586-016-4668-0) contains supplementary material, which is available to authorized users. MLF is a Sydney Medical Foundation Fellow/Sydney Medical School, CGM is supported by the Australian Research Council, and RDH is supported by the National Health and Medical Research Council of Australia. All authors have no conflict of interest. Authors have full control of all primary data and agree to allow the journal to review their data if requested.